Tim is back again and the house has never been so joyful. We have two, two month old male Vietnamese pigs. They are very tiny and sweet at the moment but a little nervous and speedy. My daughter Catherine is spending the summer with us and we agreed to her looking after them to see if pig keeping was for her. 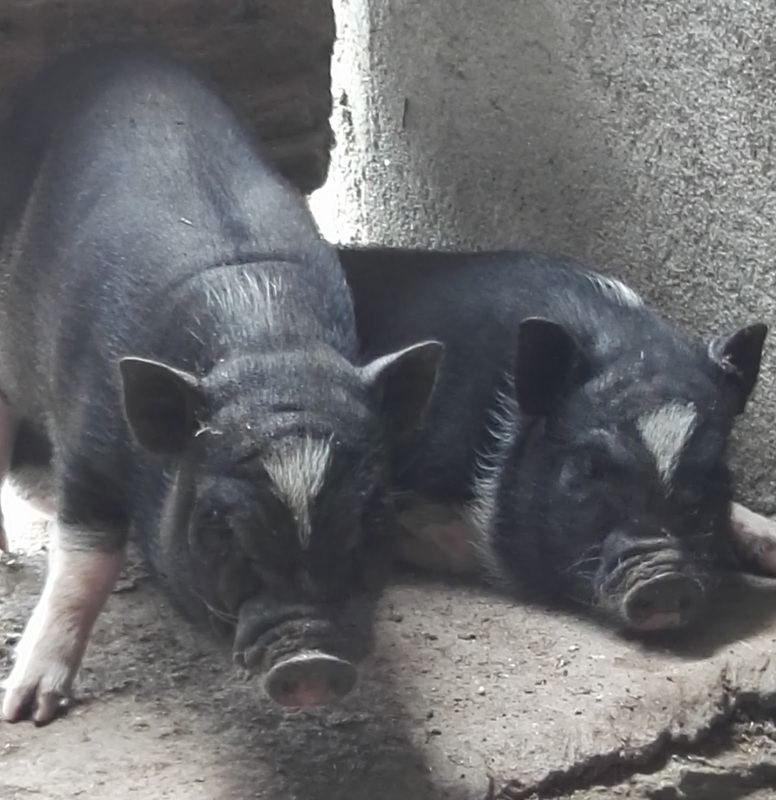 They are smaller than the usual pigs and we hope easier to handle when they get bigger. They are for meat and will be humanely slaughtered in winter and hopefully will give us some decent pork. 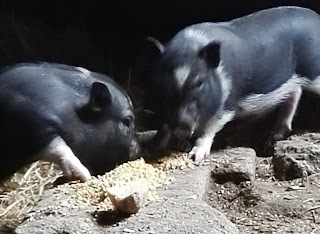 I understand that the most difficult part is keeping them slim as they have a tendency towards fattiness but like so many farming activities it is all a bit trial and error and we will learn what feeding regime suits them best. She will also have to deal with their inevitable demise and so again this will be a learning curve. She is fine with the slaughtering of poultry but pigs are a different proposition. They have a large warm stable and a decent outside run and will have the best of food and attention. They will also help us out with the egg glut which continues unabated. We have been getting some whoppers. The large one pictured weighed 102g next to a more normal sized egg. The rainy stormy weather continues. All of the planting is held back and slugs and snails are rampant this year. The fruit trees are in blossom but I hope there are enough bees to pollinate it. We are hoping to get some bees of our own soon, fingers crossed. At this time of the year there never seems to be enough time in a day to get all of the work done, thank goodness for the light evenings, when it is not raining that is. If you're going to eat it don't name it is my advice. I've only kept traditional british breeds like Old spots, Saddlebacks & Tamworths. They all get overfat if allowed. I have a friend who kept a VPB that was tame enough to enter their home but she took a liking to electricity cables & eat the insulation off the TV lead (luckily not live). Ejected to an outside life after that. My daughter is already smitten but she is 26 so she knows she will have to deal with the death part. If these go well we will move on to a couple of local celtic pigs which are full sized. You can freeze eggs Nicky, just beat them up and freeze in bags, we normally do four to a bag, they come in useful during the winter months. to use defrost in the fridge overnight. Thanks for that, I hadn't thought of freezing them. I will try it. So glad you get to enjoy having your family around. Let´s hope the weather improves, and soon! use defrost in the fridge overnight.